Nature is giving and kind. But there is another side to nature that we rarely see these days, being protected by the bubble of society. Nature is not something to joke with. It only takes one wrong step and you might potentially lose your life. That's why it is called wilderness. We might think of ourselves as wild animals in certain instances, we might think that we only harm animals and think for ourselves, but there are some of us who risk their lives to save and protect species that might never even realize what we've done. Such example is this brave woman who uses her intelligence to save a moose that falls through the thin ice. 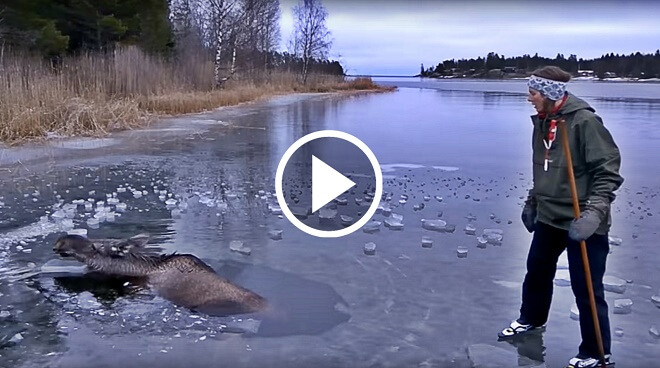 The couple were just ice skating on the remote lake when they spotted a struggling animal. They knew they had to help but with no equipment and a large moose panicking for his life this was a dangerous rescue. Amazing job.